Soon, we’ll see scenes like this at Compo Beach. Westport artist Stevan Dohanos used our beach as the inspiration for this painting. I’m not sure if the Good Humor man was ever allowed to hang out where he did. But the raft is totally legit. Back in the 1950s and early ’60s, several of them were anchored off shore. Kids did actually what the models are doing in Dohanos’ work. And a lot more. Which is probably why there are no more rafts in the waters off Compo Beach today. This entry was posted in Beach, Friday Flashback and tagged Compo Beach, Good Humor Man, Stevan Dohanos. Bookmark the permalink. Those great hamburgers (and grilled onions) were thanks to ‘Chubby’ Lane. Our kids, now in their 50’s and 60’s remember his place on the Post Rd also and often speak of those burgers. I remember the rafts in the ’40s and yes, bring them back but I guess the town doesn’t want the liability. 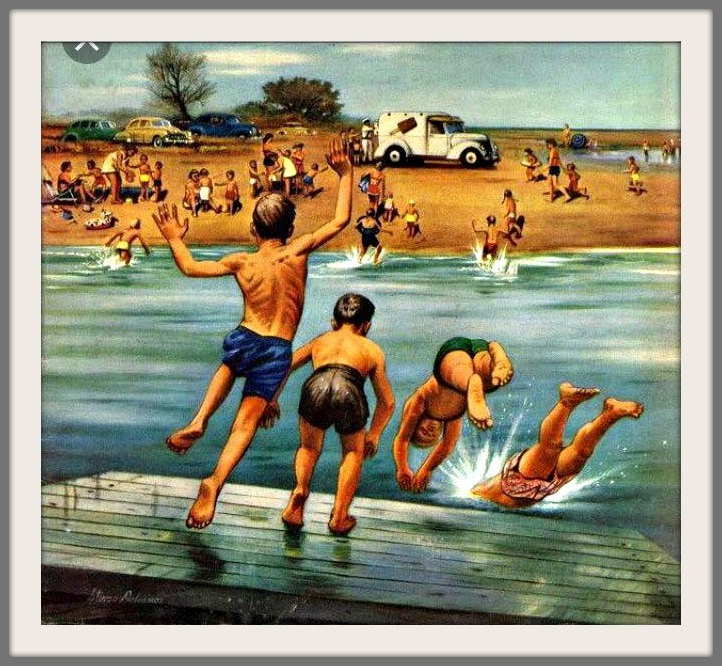 Those rafts in the early 50’s were terrific fun sad the safety rules had to remove them. But once in a while coming up underneath one while horsing around was dangerous. You sure that was inspired by Compo? Looks more like the neighborhood beach at Covelee and Norport Dr. The Good Humor man definitely did hang out that close. And there is still a raft there, as there was in the 50s. It was always a party! Found some pics, and definitely think it is the Covelee Beach. I know Dohanos reworked his scenes for his SEP covers, but this would require way too much rearranging, even for this artist. Raft is too small and close to shore, there is no place at Compo where the background features would appear so open, flat and empty, beach was all rocks in those days, and never mind the Good Humor man, the cars are way too close to the action. All of the above details, however, fit the Covelee beach to a tee. Check it out; it is still much the same. Is this a public beach with parking? Nope: private beach of the Covelee Association. We lived at 12 Covelee Drive, when what is now Bermuda Lagoon and surrounding development was all salt marsh. I remember diving off the rafts and the great burgers at Chubby’s. ahhhh! The rafts. We used to love to swim out to them. Peter is correct about the rocks; there was barely any sand to be found on Compo in those days.